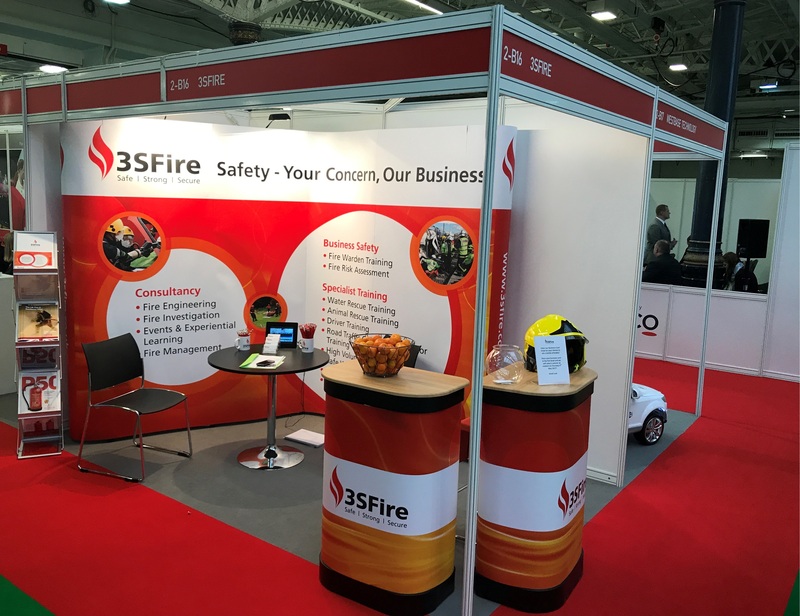 The new exhibition stand created by Mondo for fire and rescue experts 3SFire proved to be a hot attraction at London Olympia’s recent Ambition 2017 event. With a brief to maximise impact within a comparatively small shell scheme space, Mondo designed and supplied a modular pop-up solution which is quick and simple to erect, easy to transport and cost-effective. The L-shaped curved display comprises two interlinked pop-up modules which is not only flexible for use within smaller exhibition spaces but can also be extended for any larger requirements in the future with additional modules. The durable sectional graphic backdrops can be supplied separately by Mondo, enabling easy updates or message changes for different exhibitions. In addition to the main display, Mondo’s complete kit included wheeled transport cases that double-up as branded pedestals, lighting and a brochure display stand. Take a look at our Portfolio for more examples of our work.